Red denotes those won by Duff. Blue denotes counties won by Myers. 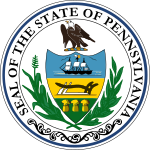 The 1950 United States Senate election in Pennsylvania was held on November 7, 1950. Incumbent Democratic U.S. Senator Francis J. Myers sought re-election, but was defeated by Republican nominee James H. Duff. ^ "Statistics of the Congressional Election of November 7, 1950" (PDF). Office of the Clerk of the U.S. House. Retrieved 8 July 2014. This page was last edited on 27 February 2019, at 16:35 (UTC).